Butter Mints Recipe | Vegan and Easy to Make! 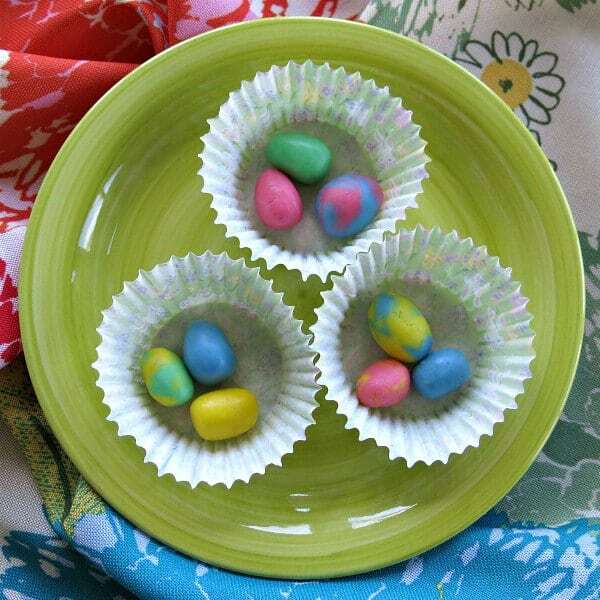 This Butter Mints Recipe can be shaped like Easter eggs, used in a candy mold or shaped with cookie cutters. It’s perfect for everyone including someone who is vegan or has food allergies! And, a tasty after-dinner treat that everyone can enjoy is just what you need at the holidays and exactly why we make these butter mints every year along with our Vegan Chocolate Cupcakes. Almost all of our dessert recipes include directions to make them free of dairy and egg too because we don’t want anyone to miss out on dessert at our house. Tasty butter mint dough + a little creativity = lots of fun too. We usually make this candy at Easter time. 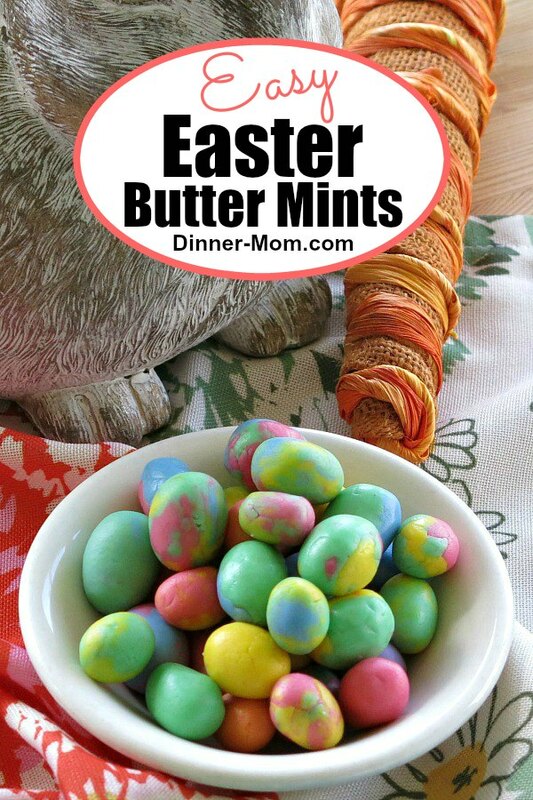 However, this butter mint recipe can be used in molds and with cookie cutters too. Mother’s Day, showers…you name it. They are always a hit. The dough can also be shaped like a candy cane for Christmas or made into a flower as part of cake topper. Just let your inner child run wild – think “play dough.” This recipe is inspired by an American Girl project my girls and I tried! Light Corn Syrup – which is lighter in flavor and color than regular corn syrup. Variation: Use a different type of extract, such as orange or almond, for a completely different flavor profile. This small batch recipe makes a piece of dough about the size of a small grapefruit. The recipe can be doubled or tripled. Warning: Food dyes will stain. Be sure to supervise young ones, work over an area that can be easily cleaned and wear an apron or clothes that don’t matter. Buttermint dough is easy to work with when slightly cool and kneaded. During the course of working with the dough, you may have to knead it to return it to a nice, pliable consistency. Making items out of small balls are easiest. Baked clay sites have lots of ideas. Use small cookie cutters to create hearts and other shapes. 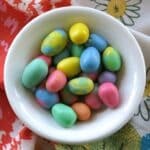 Make marbled eggs by combining different colors or only partially mixing the food dye into the dough. Roll into snakes and use a knife to cut into small pieces. Store in an airtight container or ziplock bag for about a week in the refrigerator. The dough freezes best when it is slightly on the wet side. After you defrost the dough in the refrigerator, knead it until it’s the desired consistency. Too wet? Add very small amounts of powdered sugar in batches and knead until firm. Too dry? Add a drop or two of corn syrup and massage until it holds together. 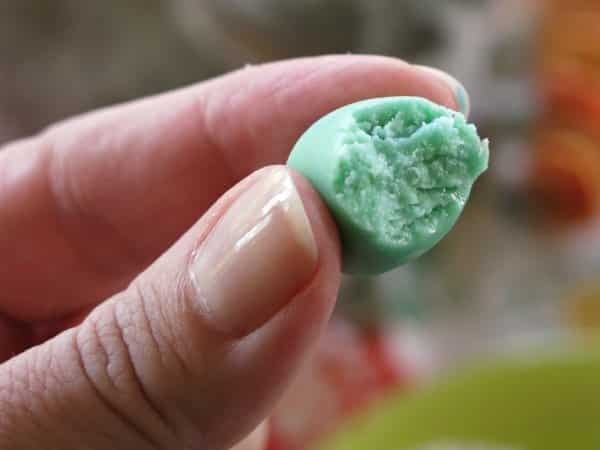 This homemade Butter Mints recipe is perfect for everyone including someone who is vegan or has food allergies! Cream butter and corn syrup in a bowl. Add salt and peppermint extract. Gradually add powdered sugar until mixture thickens to a dough consistency. Continue to knead dough adding more powdered sugar if necessary until dough is thick enough to mold. Break dough into portions to color. This batch was broken into 4 equal portions. Make a small well in the middle of each dough segment and squeeze 1 drop of food coloring into the well. The food dye may stain hands and clothing. Use gloves and dress accordingly! Pull off small pieces of dough and roll into eggs or desired shape! Love the sesonality of this recipe…looking forward to baking them! These mints are just adorable! 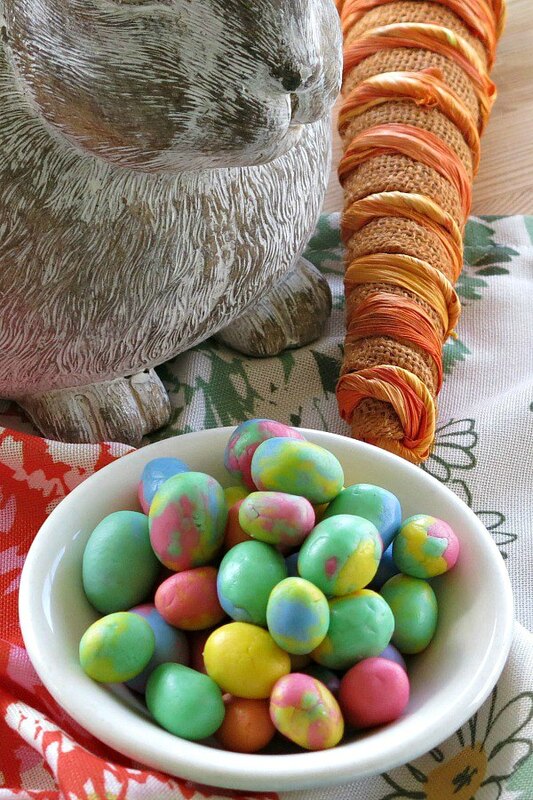 So festive and fun, the perfect treat for Easter! My kids loved making these mints with me. Can’t wait to make another batch closer to Easter!